Happy Holidays from Sim Stories! Wishing you all a wonderful holiday season, no matter what holiday or seasonal traditions you happen to observe! I'm a fulltime librarian, a chronic migraineur, a tea addict, and an avid Simmer that writes SimLit and maintains the Stories and Legacies Index, a link directory of SimLit on Wordpress. Though I obviously love cats, I actually don't own one! (Blame my apartment lease for that!) I do have a charming old cockatiel, Kali, that has been my companion for the last seventeen years! This entry was posted in Holiday Cards and tagged character: Casanova Kitty, character: Mastress Alita, game: Sims 3, site: holiday card. Bookmark the permalink. 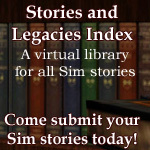 Enter your email address to follow Sim Stories and receive notifications of new posts by email.